Caffeine in tea is naturally occurring. All teas made from the Camellia sinensis plant contain caffeine. This includes black, green, oolong, and white tea. Studies have shown that the caffeine content does not vary greatly among these four types of tea. Herbal teas are made from other plants and do not normally contain caffeine. *An 8 oz. serving of tea refers to a cup of tea made from one tea bag or one teaspoon of dry loose leaf tea. 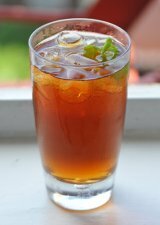 Iced tea (excluding instant) typically contains similar amounts of caffeine as hot teas. Generally all teas contain less caffeine than an equivalent amount of coffee. Decaf tea contains only 2 to 3 mg of caffeine per cup. The caffeine content in tea depends on a number of factors. No precise caffeine content can be assigned to any given tea type because it is based on so many variables. The assamica variety of Camellia sinensis (grown in India and used for Assam tea and some popular tea blends like Irish Breakfast) naturally has more caffeine than the Chinese variety of the same plant. Young leaves and buds at the end of the tea shoot contain more caffeine than more mature leaves. Broken leaves release caffeine into the tea at a faster rate than whole leaves. Tea bags usually contain very small leaf pieces and therefore tea made using tea bags tends to be more caffeinated than whole leaf tea. Tea leaves plucked in warmer months often contains more caffeine than the slower-growing tea leaves from cooler months. Longer steeping time, hotter water temperatures, and more tea leaves all contribute to higher levels of caffeine in a cup of tea. Caffeine is a stimulant. It is absorbed quickly by the body and affects the central nervous system. Caffeine increases mental alertness and the ability to focus. It is safe for most people in moderate amounts (300 mg/day or less). Caffeine can, however, cause irritability and insomnia in high doses or for those who are particularly sensitive to the chemical. Learn more about decaffeinated tea. Why Do Tea Leaves Contain Caffeine? We know that caffeine has an impact on humans, but what's in it for the tea plant? Caffeine acts as a natural insect deterrent, protecting the tea plant from getting eaten. Younger leaves are more tender and therefore more vulnerable to being eaten, which is why they contain more caffeine.